While human beings have acquired the ability to launch rockets and people into space and explore the heavens, Deuteronomy in Parashat Nitzavim tells us that Torah–the totality of our received tradition from God–is “lo bashamayim hi,” “it is not in heaven” (Deuteronomy 30:12). This phrase has been understood that the Torah is not an esoteric document. It is meant for human beings in this world to explore, interpret and reinterpret. This verse plays a central role in one of the most famous passages in the Talmud, Bava Metzia 59b, in which Rabbi Eliezer is in a dispute with Rabbi Joshua and the majority of sages. Rabbi Eliezer performs miracles and even has a divine voice from the heavens call out that the law is in accordance with him. Rabbi Joshua, however, says “Lo bashamayim hi,” “[The Torah] is not in heaven.” God laughs in response and says, “My children have defeated me.” The Torah is meant to be studied and reinterpreted in each generation. This week’s Torah portion, Ki-Tetze, begins and ends with accounts of war. The midrash interprets the various laws of the opening section (Deuteronomy 21: 10-21) as a narrative thread underscoring the ravages of war. A soldier in the heat of battle covets a female prisoner and, under the power of lust, marries her (vv. 10-14); in the end, he will lose feelings of affection for her and for the children he fathers with her (15-17), and those children will grow up disrespectful (vv. 18-21) of their parents. The very end of the portion (25: 17-19) recounts the Amelekites’ surprise attack on the Israelites in which they preyed upon the most vulnerable. We have the paradoxical instructions both to “Remember!” and to “blot out the memory of Amalek.” Rashi notes that immediately prior to this section we have the commandment to keep fair weights and measures. He says that the juxtaposition of these texts shows that when we are lax in business ethics, we open ourselves up to communal disaster in which the weakest members of the community will pay the steepest price. Indeed, all of the laws in Ki-Tetze underscore what Rabbi Harold Kushner calls “the irreducible dignity and worth of a human being.” Without this societal norm, we are vulnerable to the scourge of war. “Justice, justice you shall pursue.” This is the clarion call of Parashat Shofetim (Deuteronomy 16: 20). It is in the context of Moses instructing the Israelites to create the institutional infrastructure for a just society. The scales of justice on my tie evoke this central and eternal Jewish quest for justice. PS: Mazal Tov, Sam, on becoming Bar Mitzvah! The “eye chart” tie relates to the very first word of this week’s portion: Re’eh/ Look/See. As Moses addresses the Israelites throughout the book of Deuteronomy, he appeals to multiple senses. Many of us are well familiar with Deuteronomy 6: 4, Sh’ma Yisrael/ Listen up, Israel! Adonai is our God. Adonai is one. In the opening to this week’s Torah portion, Moses appeals to the sense of sight in laying out the choice faced by the Israelites: Re’eh/ Look (folks)! I set before you blessing and curse: blessing, if you obey the commandments of the Lord your God that I enjoin upon you this day; and curse, if you do not obey the commandments of the Lord your God, but turn away from the path that I enjoin upon you this day and follow other gods, whom you have not experienced. Parashat Devarim begins “These are the words….” Hence, a crossword puzzle tie. Parashat Devarim begins: “These are the words which Moses spoke to all Israel on this side of the Jordan in the wilderness, in the Arabah opposite the Red Sea, between Paran, and Tophel, and Laban, and Hazeroth, and Dizahab” (Deuteronomy 1:1). When Moses is first called upon by God to lead the Israelites out of Egypt he tries to get out of the task by saying he can’t speak. Now, 40 years later, Moses delivers to the people a long succession of speeches that are compiled in the book of Devarim/Deuteronomy. Moses has found his groove as a speaker, and he spends the fifth book of the Torah reminding the people of their sacred mission. His facility with Devarim/ words inspires this week’s crossword-themed tie. Speaking of words, there is another important link between the Torah portion and the season. This is Shabbat Hazon, the Shabbat immediately preceding Tisha B’Av, the fast of the Ninth of Av commemorating the destruction of the First and Second Temples. The sages teach that sinat hinam, causeless hatred among Jews, easily enabled the Roman destruction of the Temple and Jerusalem. Therefore, this season is a time to reflect on the words we say and how we say them. Let’s focus on words of kindness, rather than words of hatred. On Simhat Torah we celebrate our completion of the Torah reading cycle, and we begin again–from the beginning. 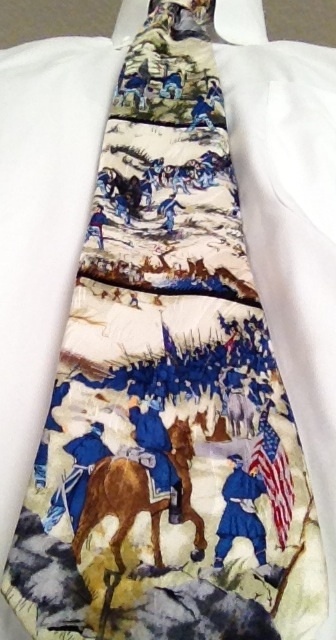 It’s a #TieBlog doubleheader as we head into the last round of fall holidays. On Simhat Torah, we engage in the powerful ritual of completing the book of Deuteronomy and immediately returning to read the beginning of Genesis. I think these ties speak for themselves. Hag Sameah! 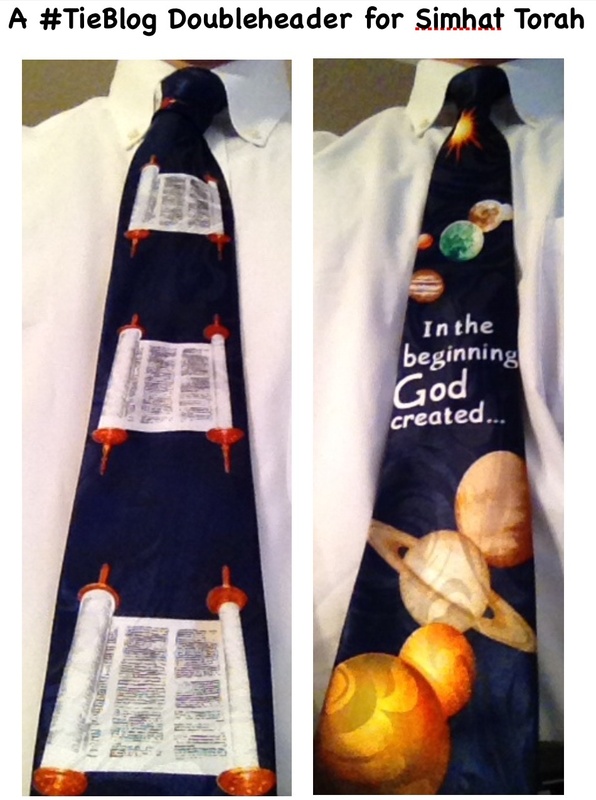 Of the ties in my Torah Tie collection, I especially like the ones that have explicit scriptural references. For Sukkot and Shemini Atzeret, this tie is particularly apt. Deuteronomy 16, which is read in the Diaspora on Shemini Atzeret morning, describes the calendar of holidays. With respect to Sukkot, the Torah commands (verse 14) “And you shall rejoice on you Hag (Festival, referring specifically to Sukkot)” and then adds shortly thereafter (verse 15) “And you shall be especially joyful.” The tie conflates these verse fragments into one statement, which is a popular song at this time of year: V’samachta b’hagecha, v’hayyita ach sameah. May the season bring joy to all.